Find your place in line for a green card! 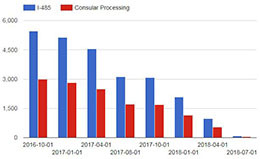 The green card tracker is an easy-to-use tool built on USCIS pending I-485 inventories, and can show you the total number of green card applicants (I-485 and CP) waiting ahead of you. Years of government data at your fingertips! Due to traveling, May 2019 Visa Bulletin will not be updated in time. Please visit Department of State for official release. 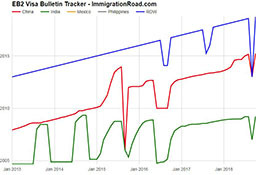 Latest visa bulletin, cutoff dates and predictions. Search by year/month, or see all cut-off dates just for your own category. A NEW Way to track visa bulletins and cutoff dates! Wondering what is going on with your immigration application? Learn how to check your USCIS case status either online, by phone, by email or in person through InfoPass. For further questions or to check the status of your application filed with other government agencies (DOS, DOL, CBP, FBI, etc. ), here is an extensive list of contact methods.